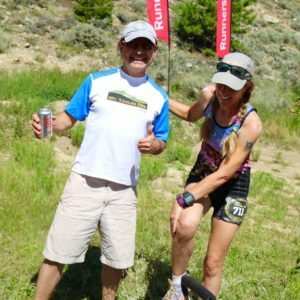 On the third weekend of August, I run the Leadville 100. I’ve done it every year since 2012, and will keep doing it until I’m too old and feeble to run. 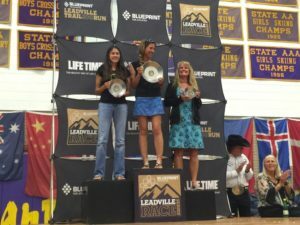 Other races come and go, but Leadville remains, a steady beacon in the chaos of my life. Why do I feel its magnetic force every year? Why, after four starts and three finishes, does this race continue to intrigue me? THE ORDINARY WORLD. The hero is introduced sympathetically so the audience can identify with him or her. Some kind of polarity in the hero’s life is causing confusion and stress. 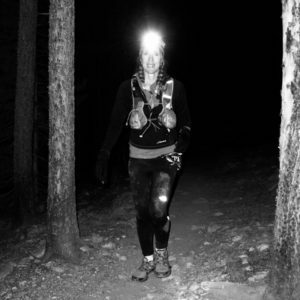 Meet Katrin Silva, just another middle-aged teacher with OCD tendencies and a love for running in the mountains. 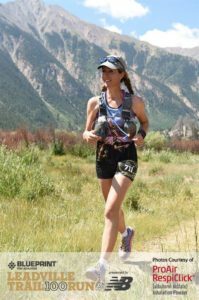 She has finished nine 100-mile races the last six years, but fears she is past her prime since entering her mid-forties. There are way too many days when she feels old, frumpy, and way too close to normal. She fears monotony more than anything. She wants to live an intense, extraordinary life. But how? 2. THE CALL TO ADVENTURE. Something shakes up the situation, so the hero must face the beginnings of change. In December 2015, the darkest, gloomiest month of the fading year, Katrin feels desperate. As part of her valiant struggle against looming old age, she enters the lottery for the 2016 Leadville 100. In January, she receives an email bearing good news: she has been chosen! Suddenly, her life has regained purpose and sparkle. 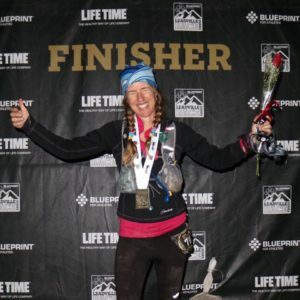 Adding another Big Buckle, aka the saucer-sized award for finishing in under 25 hours, to her accessory collection becomes a goal worth training for. She increases her mileage and, like a true superhero, curbs her consumption of refined sugar and alcohol. 3. REFUSAL OF THE CALL. The hero feels the fear of the unknown and tries to turn away from the adventure, however briefly. By late June, life interferes in the guise of injuries and family obligations. Instead of ramping up in volume,intensity, and altitude, Katrin’s training is reduced to hour-long jogs at sea level. Her 46th birthday sets off an avalanche of self-doubt. She returns to the US a couple of weeks before race time, far from prepared, yet unwilling to let go of her goal. 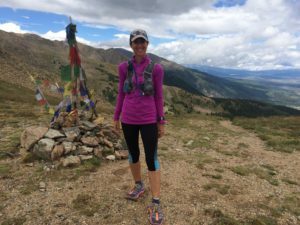 Tormented by conflicting emotions, she travels to Leadville. 4. MEETING WITH THE MENTOR. The hero comes across one or more seasoned travelers of the worlds who give him or her training, equipment, or advice that will help on the journey. My 2016 race plan – the (overly optimistic) sub-23 side. The reverse shows the much more realistic sub-25 splits. Still struggling with self-doubt, Katrin attends the pre-race briefing, where race founders Ken and Merilee remind her and 700 other buckle dreamers to dig deep: “You are tougher than you think you are, and you can do more than you think you can!” These wise words help our hero regain some confidence. She gathers more courage from other members of the buckle fellowship at John Scott’s famous pre-race pasta feast, then returns to the Victorian castle she and her companions have rented for the weekend, she finds David, her faithful husband/pacer/crew/photographer combo model, arrived to lend assistance. 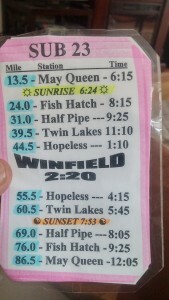 He hands her a good-luck charm in the form of a laminated, color-coded pocket-size pace chart for a sub-25 hour finish. Nothing can go wrong now! Our hero studies the precious document, holding onto it as she falls into a fitful sleep for about two hours. 5. CROSSING THE THRESHOLD. At the end of Act One, the hero commits to leaving the Ordinary World and entering a new region with unfamiliar rules and values. The alarm rings at 3 a.m – a sure sign that normal rules no longer apply. Katrin studies the pace chart one more time while sipping her pre-race cup of coffee. She knows where she has to be when to get that buckle. 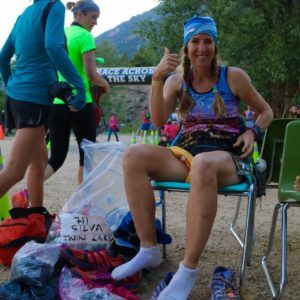 Our hero dons her lucky socks and lucky sport bra before calmly performing other last-minute rituals, like the ceremonial application of Body Glide in strategic places. It’s 4 a.m. Time to go. 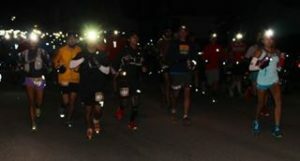 Dressed for battle in headlamps, hydration vests and colorful shoes, all 700 members of the buckle fellowship begin their dangerous quest. They take off down 6th street at breakneck speed, to the claps and cheers of townspeople lining the streets. Soon, the pavement ends. Darkness swallows our heroes as they head out into the great unknown. Under a nearly full moon, they file onto the single track around Turquoise Lake, where the first light of the new day greets them. Katrin reaches May Queen in 2:14, exactly on target. 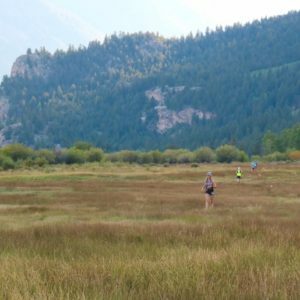 From there, the first major climb, the first steep descent, and a beautiful, runnable section to Twin Lakes, along rolling singletrack with sunlight filtering serenely through tall aspen trees. The calm before the storm. At the Twin Lakes aid station, mile 40. her loyal crew, aka David and Rachael, await our hero with sunscreen, watermelon slices, and encouraging words before she faces Mt Doom, aka Hope(less) Pass. Only 60 miles to go! 8. THE ORDEAL. Near the middle of the story, the hero enters a central space in the Special World and confronts his or her greatest fear. Out of the moment of death comes a new life. In ancient times, the river Styx separated the realm of the living from that of the dead. 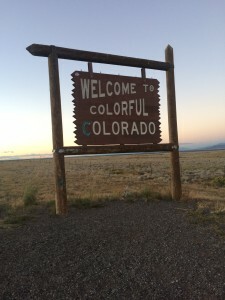 In modern-day Leadville, the Arkansas river between Twin Lakes and the the entrance to the special world’s inner sanctum plays a similar role. Our hero splashes through numerous mud puddles, then wades across the freezing cold, knee-deep threshold, clinging to the rope that symbolizes her last tenuous hold on reality. She powerhikes at a slow but steady pace through dense, dark forest until she reaches an altitude that trees can’t handle. 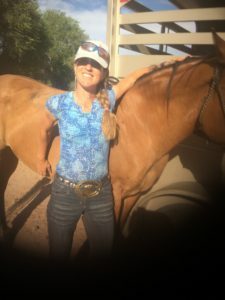 Though she is on a buckle mission, urged on by the 25-hour pace chart, she takes a couple of minutes at Hopeless to stop and hug the adorable Llamas. She also stops quite a few times to gasp for air, painfully aware of her missing altitude training. And of course, she stops at the top of Hope Pass to enjoy the glorious views for a moment. Still, she reaches Winfield in 10:37, within a five-minute margin of the sub-25 cutoff. There is no time to celebrate. Instead, it’s time to turn around and get back over that pass. This section is a killer for legs and lungs, but at the same time a good opportunity to a) see her friends and allies on the course, and b) figure out the female competition ahead of her. Adrian Stanciu, the Dorito-fueled superhuman speed demon, has blazed back up the trail along time ago, on his way to a spectacular tenth place finish. Dave the Vegan is not too far behind our hero, John a little further, along with Eric, Lynette, and Jody. The members of the buckle fellowship try to smile at each other, but fool no one: they’re in pain. Katrin notices that all the women ahead of her look very young. The competitive instinct slumbering within her wakes up. Could she still place in her age group? After an eternity of very slow climbing, our hero crests the cold, windy heights of Hope Pass a second time before descending back into warmer temperatures and more oxygen. 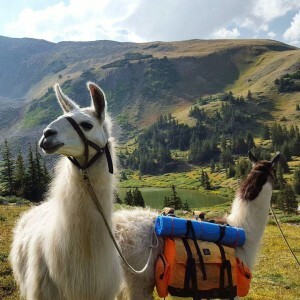 In the gentle sunlight of late afternoon, she crosses the river back into more familiar territory of the Twin Lakes aid station, where her faithful companions David and Rachael await, along with a styrofoam cup of comforting Ramen noodles. Katrin puts on her head lamp and warm clothes in preparation for for the long, cold night ahead. Our hero is still on track for a 25-hour finish, but way too close for comfort. 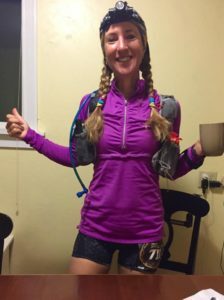 Rachael is supposed to pace Katrin for the next 27 miles to May Queen, but Katrin is in a hurry, eager to complete her mission of bringing home another big buckle. She feels a little guilty, but soon leaves Rachael behind in the aspen forest and keeps running. 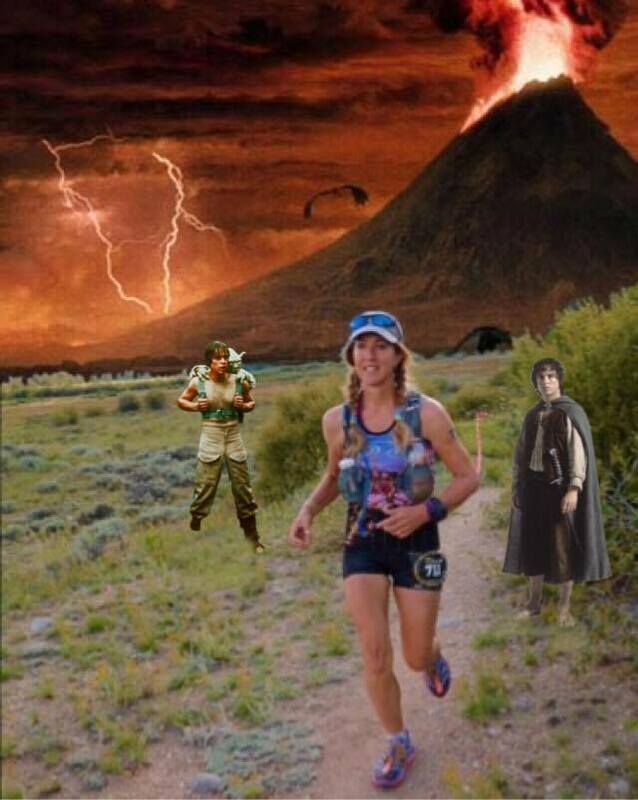 Rachael is a fellow ultra runner, so she understands. Darkness descends on the buckle fellowship. Katrin runs hard, but then fritters away precious minutes at the way too inviting Half Pipe aid station, slurping another cup of ramen noodles and fiddling with layers of clothing, batteries, and gloves. Yes, it was real. A welcome sight on the powerline summit. 11. THE RESURRECTION. At the climax, the hero is severely tested once more on the threshold of home. 30 miles to go. It’s dark. It’s cold. It’s 10 p.m. Our exhausted hero has still only minutes to spare for a 25-hour finish. She knows she has to dig deep to get that big buckle. The powerlines climb is the last major obstacle between her and the finish line. 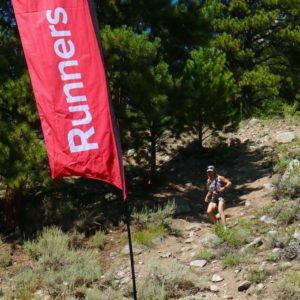 Its five false summits between mile 80 and 85 can demoralize even the most accomplished runners. Katrin knows this mountain well. She has learned to expect its devious qualities and to mistrust its promises. Our stubborn hero, still without a pacer, braces her aching back and puts one aching foot in front of the other as fast as she can. Friendly ghosts, aka the awesome Leadville Shack club, have transformed the final, real Sugarloaf summit into a surreal space-ship like aid station. The ghosts offer weary travelers hugs and high fives. Katrin’s spirits lift. 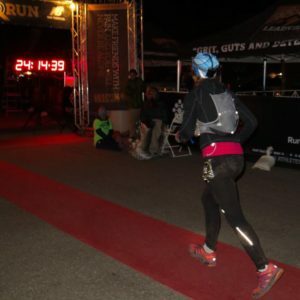 She wisely resists the temptation of pain relief in the form of tequila, then runs down the mountain toward May Queen, where David awaits to pace her to the finish. 12. RETURN WITH THE ELIXIR. The hero returns home, bearing some element of the treasure that has the power to transform the world as the hero has been transformed. It’s after midnight. Utterly depleted, our hero forces her sore muscles to keep moving for another 13 miles. She wants to walk, not run. David begs and pleads, to no avail. Desperate, he resorts to crooning love ballads from the 1970s. An unfair strategy, but it works: Katrin agrees to keep shuffling along in return for silence. A full moon shines over Turquoise Lake. The night is beautiful, but not beautiful enough to eclipse the screaming pain runners are in by now. In the distance, the lights of Leadville call our weary hero home. Will she get there in time for the big buckle? She does not know, and does not want to know. She is digging as deep as she can. Run, walk, run. Pain is temporary. One last downhill, one last climb require last reserves of energy. The dirt road. Then the pavement. One more mile! The finish line beckons in the distance. Like a horse smelling the barn, Katrin runs faster. A red carpet. A few more steps. The glowing numbers on the clock say 24:14. Well under 25 hours, well within the big buckle time, and an age group win. Our hero hugs Merilee, hugs David, hugs Rachael. Maybe she did not save the world, but she did conquer her Dark Side: her fear, and her doubt are vanquished, at least until next year. 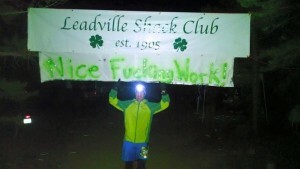 It is a good time to be alive and running, in Leadville or wherever you may be. The coveted big buckle. Yes, I wear it to work! This entry was posted in Uncategorized on August 31, 2016 by silvakat. Really liked this one. It was humorous and yet, there was an element of suspense. Thank you! It’s been brewing in the back of my mind for a while. Nice report and good writing. “Looming old age,” I think you can keep that at bay for a while. Thank you, Joe! I like to think of looming old age as my motivational coach. It’s like a scary specter that gets me out the door every day. After a while, that looming old age just becomes a rumpled rug which you need to step over to get out the door….